The overseas arm of China Tobacco will list in Hong Kong. Sales abroad are growing. But most of its revenue comes from importing leaves for its parent, a monopoly in a country where 300 million people light up. That's a lot of risky exposure to dated anti-smoking policies. The Marlboro maker is paying a whopping multiple for 35 pct of Juul Labs - and cutting jobs and up to $600 mln of expenses just to cover interest costs. Meanwhile Juul is handing much of the cash to current owners and staff. It’s a risky bet that rapid growth won’t start to drag. Marlboro maker Altria is spending $1.8 billion – more than a 40 percent premium – for a 45 percent stake in pot grower Cronos. The valuation is both high and irrelevant. Cannabis is beginning to adopt Silicon Valley’s belief that the winner is whoever has the most cash. Altria can easily afford to swallow $2 bln pot producer Cronos. It’s the seller – and its peers – that could pay a high price. Companies want the product to be seen as medicinal not lethal, edible not smokable, and more like beer than tobacco. Not all capital infusions are equal. The $100 billion Marlboro maker may be eyeing a stake in the vaping unicorn as e-cigarettes cut into its growth. Buying upstarts can be expensive for mature companies threatened with disruption. But Juul now has regulators on its back. That could help Altria strike a bargain. An ill-timed expansion left the Irish firm struggling with a tough market for generic drugs. Now it has hired a new chief who formerly ran cigarette companies, breaking a pharma-sector taboo. That’s an emphatic statement that its future lies in consumer goods. The UK clothes chain has sketched out a scenario where high-street store sales keep shrinking until they can’t cover their cash costs. Even in that dismal situation, Next would be worth only a third less than now. Few companies consider their own demise in this way; more should. The maker of Camel has a shrinking share of its home market. A mooted purchase of Philippine assets from troubled Mighty for $890 mln will give Japan Tobacco a lift in a nation where people are still lighting up. But it also underscores the firm's existential growth challenges. Aviva is the latest investor to quit cigarette stocks. The sector has yet to suffer any material harm. Nor does it lack capital. Yet there are good reasons to be nervous: growing regulatory risk and competition from electronic alternatives make current valuations unsustainable. British cigarette maker British American Tobacco has bumped its offer for its U.S. rival, offering $49 bln for the shares it doesn’t already have. The deal should easily hit BAT’s return targets, even if savings aren’t huge. Reynolds was right to hold out. The UK tobacco giant has offered a near 20-pct premium for the 58 pct of the U.S.-based Camel-maker it doesn't own. It's opportunistic - Reynolds just named a new boss, and has disappointed investors. Still, the logic of uniting the two is as hard to resist as a Newport menthol. 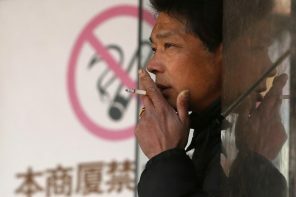 The $290 bln California pension fund may reinvest in tobacco stocks after a report found that exiting the sector cost it $3 bln over 15 years. There’s more to the idea than higher returns, though. Engaging financially with controversial firms can be a better way to effect change. The buyer is paying $5 bln for the overseas rights to the U.S. cigarette group’s American Spirit brand - a whopping 250 times earnings. It’ll allow Reynolds to exhale a cloud of debt as it focuses on U.S. sales. Its strategy is a handy guide for similarly challenged sectors. The summer parlor game from Wall Street to K Street to Meadow Lane in the Hamptons is guessing where the former U.S. House majority leader will work after decamping from Congress. It’s easy to imagine how a recruiter might try to put his experience to good – and lucrative – use. Reynolds and Lorillard have gained over $10 bln of market value since talk of their $55 bln merger surfaced. That can’t be justified by promised savings or the market rally. Anticipation of a surge in pricing power through the creation of a duopoly explains investor enthusiasm. The UK tobacco group wants to acquire assets sold following a possible merger of U.S. peers Reynolds and Lorillard. Imperial may win a path to scale in America. But the positive market reaction is too sanguine about balance-sheet strain and the acquisition of low-growth assets. Reynolds American might be mulling a bid for rival Lorillard. Similar deals suggest the Camel cigarette maker could sensibly stretch to offer a 30 pct premium. The strategic benefits are also fairly clear. But antitrust and other watchdogs may send any transaction up in smoke. Warren Buffett reckons some dogeared stocks can deliver more puff than expected. USfocused Altria's cigarette volumes are falling and healthcare reforms could further burden smokers and manufacturers. But investors could be underestimating the Marlboro Man's resilience.